French painter. Until the advent of Cubism, Henri Matisse was the most influential painter in Paris, if not in Europe, and he remains one of the most important artists of the c. His emancipation of colour has an historical importance comparable to Cubism's role in releasing form from representation, and his Notes d'un peintre (1908) stated clearly for the 1st time several principles that lie behind later developments in 20th-c. painting. Henri Matisse first studied law in Paris and worked as a lawyer's clerk at St Quentin. Henri Matisse started to draw and paint c. 1890 and in 1892 studied in Paris, first under Bouguereau at the Académie Julian, and then (1893-8) in Moreau's studio at the École des Beaux-Arts, where Marquet became his close friend and he met Rouault, Manguin and other future Fauves. His early independent works painted in Brittany (1896-8) were restrained objective interiors and still-lifes, reflecting his admiration for Chardin. In the late 1890s, under the influence of Impressionism and Neo-Impressionism, Henri Matisse began to paint in heightened colour, but dissatisfied with Divisionism, he turned to Cézanne. Although poor at the time, he purchased from Vollard in 1899 the small Cézanne Bathers which later 'sustained me spiritually in the critical moments of my career as an artist'. Working at the Académie Carriüre (c. 1899-1900) where he met Derain, and later in a studio at Quai St-Michel, Henri Matisse concentrated until 1904 on structural strength in his painting. Académie Bleu (c. 1900) shows the transition from brilliant colour to crudely simple draughtsmanship and solidly modelled form. Significantly he made his 1st sculpture at this time: sculpture continued throughout his career to be an extension of his painting. The experimental phase ended when in 1904, working at St-Tropez, the renewed contact with the brilliant Neo-Impressionist palette proved the springboard to Fauvism. Henri Matisse's leadership was recognized and in his major works of the period, Luxe, calme et volupté (1905) and Joie de vivre (1905-6) the fundamental character of his whole oeuvre was emerging. 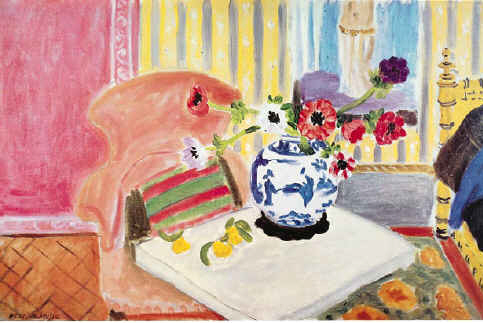 Henri Matisse was concerned with an expressive art, with a seriousness of purpose comparable to the German Expressionists (whom he influenced) but totally different from them in mood and technique. In his art primitive forms are assimilated without their disturbing violence, e.g. Portrait of Madame Matisse (1913), and his treatment of colour and line never loses sight of their artistic, pictorial values. The difference is fully apparent in his belief that 'only one who is able to order his emotions systematically is an artist'. Henri Matisse wrote in his Notes d'un peintre (1908): 'What I dream of is an art of balance, purity and serenity, devoid of troubling or depressing subject-matter ... which might be ... like an appeasing influence, a mental soother, something like a good armchair in which to rest from physical fatigue.' He worked in brilliant colour at Collioure (1905) with Derain and each painted a portrait of the other. Although his palette was somewhat subdued during the 1910s, e.g. Pond at Trivaux (c. 1916) or Painter and his Model (1916), he was as little touched by Cubism as Picasso was by Fauvism. Henri Matisse was deeply impressed by an exhibition of Near Eastern art in Munich (1910) and visited Morocco. His love of oriental fabrics and ceramics is reflected in the exotic decorative details and character of the great Odalisques of 1920-5. From 1917 he lived at Nice, with a visit to the U.S.A. and Tahiti in 1930-1. He worked on the chapel at Vence (1949-51); his other late works include the remarkable collages of cut-out, gouache-coloured paper shapes arranged in terms of expressive abstract rhythms, e.g. I'Escargot (1953).